Join TWO Master Alchemists - Neelam Minocha and Jeralyn Glass from LA for a powerful journey of Unconditional Love and Alchemy, Channelled Meditations, Breathwork, Sound and Light Transmissions and Sacred Ceremony. ﻿We are honoured to have the amazing Jeralyn Glass joining us from LA as we come together to take you on a magical 4 day sacred journey of the heart through powerful sound and light healing transmissions, meditations, breathwork and sacred ceremony. Sound and light have the ability to reach the deepest parts of the soul to bring up emotions that have been deeply buried and suppressed within. As we release and let go, we align with our truth and soul’s calling. This year is all about connecting with our hearts, our authentic expression, shining our light and singing our unique soul song. We are here to help you shine your light and experience your fullest expression in this lifetime. As we transcend to higher dimensions ... sound and light will take us there… A space of lightness, joy and soul expression. As we sing our soul song we come alive, letting go of fear to embody pure love and oneness. We will hold this space for you to receive in abundance as we take you on a deep healing journey of connection with your heart and truth, peeling away the layers that keep you from your freedom and liberation. Places will be limited for this retreat, and this retreat has been so popular in previous years completely selling out... each retreat is always so perfectly orchestrated and divinely guided for the group that is attending. Every group comes together for a purpose… past life connections, incredible synchronicity, powerful channellings and heart felt enriching conversations with like minded souls in a sacred and energetic vortex of love. All process work will be done at the stunningly beautiful Abbey House with grounds backing onto Glastonbury Abbey where the Michael and Mary Ley Lines criss cross creating a vortex making the venue a high energy portal for our energy work. Experience Sound Baths with an array of incredibly high vibrational alchemy bowls made with the purest of quartz crystals, gemstones and minerals that will vibrate through every cell of your being. Deposit of £300 is required with your registration form to secure your place by no later than 15th April 2019. The remaining balance is due by 15th May 2019. Please note transport does NOT include international flights to London. If you would like a private session on Monday with Jeralyn or Neelam, please let us know in advance so that we can arrange this for you. About Neelam Minocha - Spiritual Alchemist, Intuitive Healer and Channel, Group Facilitator and Mentor. Founder of Circle of Light, now spreading our light globally. "I am a Rainbow, an Alchemist, Healer and Channel. I have come to anchor in the New Consciousness - The highest vibration and energy of unconditional love, joy, abundance, balance, inner peace and freedom. The energy of Celebration. We are here to raise the vibration of the planet and direct humanity into the higher frequencies of love and compassion and 5th dimensional reality of unity consciousness. In my sessions I transmute and transform the energy within the body, mind and spirit using alchemy, and bring through the vibration of compassion, unconditional love and grace, which then creates balance, peace and flow within the body. I work with an array of incredible and beautiful Higher Beings from many other dimensions....many Star Collectives, Ascended Masters, Angelic Beings, and powerful Divine Feminine Goddesses. We are a team to help humanity shift and evolve to a higher vibration of love, unity and peace. I believe every human being has a unique gift that they bring to this world. It just needs to be uncovered and awakened. I believe in empowering people by showing individuals the beauty and truth of their souls. When we raise our vibration and frequency through healing and release work, we attract better circumstances, experiences and people into our lives". 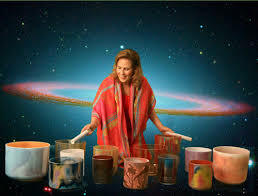 Jeralyn Glass is an internationally known Singer, Professor, Sound Healing Practitioner, and Crystal Singing Bowl Master Alchemist. Jeralyn established her classical music career in Europe, singing regularly in France, Spain, Belgium, Holland and Germany. Passionate about Music as a tool of self discovery, Jeralyn is the founder of Crystal Cadence, a place for Song and Sound Healing. She is active in the medical community, working with The Cancer Support Community in California. She has performed her high vibrational music accompanying Gregg Braden, Dr. John Gray, Marianne Williamson, Dr. Sue Morter, Barbara Marx Hubbard and Anita Moorijani. Her online series “TheSacred Science of Sound” was an international success and a live event will be held in Los Angeles November 1st to 3rd 2019. Jeralyn sang the National Anthem for over eighteen thousand people in her hometown of Los Angeles and has written and sung tributes to star athletes Kareem Abdul Jabar and Kobe Bryant as well as the former German President Horst Kohler and the former French President Valerie Giscard d’Estaing. We run annual retreats taking beautiful souls to magical places where the energy of the land is so transformational. 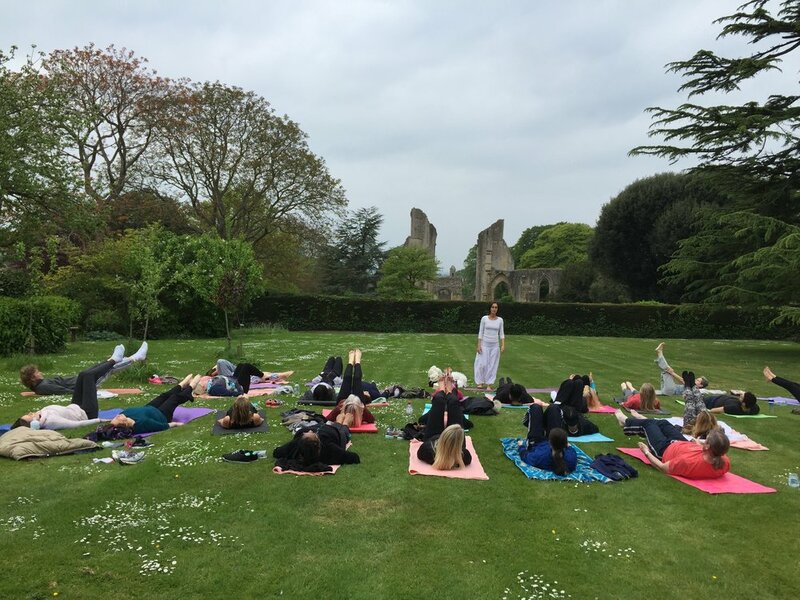 During the retreat individuals get to experience energy transmissions, sound baths, channelled meditations, group process work and kundalini yoga sessions as well as visiting all the sacred sites to connect with the energies. Could not have imagined a more beautiful and peaceful place for a retreat. Everything was AMAZING!!! Starting from the pick up point - Journey - Abbey House - Schedule - Meals - Activities. Everything was done to the highest standard. Thank you for your effort to make our journey so memorable. I had no expectations, didn't really know what to expect. Now after 3 days here I am truly amazed at the transformation I made, with the divine energy that was here all the time, beautiful people, support, guidance, care, love. I have learnt so much and am very grateful for the experience. With my heart open I will continue this journey feeling very blessed. Thank you from the bottom of my heart. I am so impressed with the organisation of this event which ran so smoothly from participant's perspective. Everything was taken care of and there was an abundance of so much on this retreat. I am really grateful for your effort and energy that you gave in this event. I've had a very powerful and deep experience especially in terms of healing and letting go. I've experienced realisations about myself, some of the issues that I needed to resolve and got practical knowledge and understanding on steps to take to find my path, my truth. Thank you so much for a truly healing, inspiring and full of synchronicity retreat. It was lovely to connect with so many beautiful souls. Words almost cannot describe my thoughts and feelings. I left feeling like a family. I did not know what to expect since I have never done anything like this before. The whole experience blew me away on so many levels. This is one trip I will never forget! I'm sure you have not heard the last of me. Ha! Ha! It is only the start of something beautiful. The retreat was very well organised. Kudos to you ladies! You did an excellent job!! Wow! Wow! Wow! An unforgettable experience only wish it was longer. This retreat was extremely well organised down to the smallest detail. I have felt well looked after and loved. This journey has been fantastic and difficult at times however the support I have received from everybody on this retreat has been unbelievable. I have learnt new things experienced magical events. I truly truly find it very difficult to describe and put my feelings of how this has changed my life. My rebirth has just happened here in Glastonbury. I will be taking all I have learnt and experienced forward to my home, family and life. Superb says it all!!! When I arrived I was rather troubled. April was difficult, Friday and Saturday I created space to be alone as much as possible. After the sound bath and quiz my mood lifted. Today I am back on track. I have identified my passion - it has been there for a long time but I had not recognised it (took it for granted). My heart is open and full of joy. Neelam and Alex's talks/meditations are brilliant and moving and informative. Thank you to everyone. Everything ran super smoothly from the very first email. Incredibly well organised, everyone was well informed via email and verbally at Abbey House. Very impressed with the amount of effort and detail the team put into creating a very special weekend. I have had an amazing weekend experienced some powerful energy shifts, reconnected with myself, with the beauty of Mother Earth and the power of sound and rhythm, and the deliciousness of Kundalini Yoga. I will bring so much more of all of this into my life. I feel open hearted, nurtured, loved, connected and so blessed to have shared the retreat with a group of beautiful souls. A very well organised retreat which was so seamless. Beautiful. Great location which really made the experience. When I connected with my heart, I realised my intentions were very different. This was a great awakening and a great start to my journey. Thank you all for a phenomenal experience and enlightenment. Thank you Neelam, the whole thing was amazing, your meditations sooooooo nourishing .... it felt like we were all looked after in Gods hands through you. My whole body was shaking, it was something out of this world, I just could not stop crying. It is hard to find words as yet... overwhelming experience. I had an amazing experience. The group, the meditation experiences were all amazing. Feeling a mixed level of emotions on the last day. So happy and blessed to have experienced this and meeting all the people, and sad that it has come to an end. This is one experience that I will never forget and has taught me things I need to do to improve my way of life. Thank you for organising such an amazing event which has really nourished my soul. I do not think it could have been more perfectly planned! It was beautifully organised, well thought out and executed perfectly. It met my greatest expectations. The experience and the group were simply amazing and I will treasure them for a long time to come. So much was fit into a short weekend and I feel so blessed to have been a part of this beautiful retreat. Thank you for making my birthday celebration unforgettable and incredibly special. Turning 50 is not so bad now. Really magical experience and great organisation of retreat. Lots of activities and richness of experience. Nutrition, Kundalini Yoga, Soundbath, Night walk to the Tor - Amazing! Neelam brings so powerful and transformative energies and makes everyone feel welcomed and gave her best in the retreat. A great place for peace, love, nurturing. I wish it was longer! Would like to thank Neelam, Kuldeep, Alex, Megan and Martin for excellent organisation. Venue and content and bringing everyone and everything together into a magical experience. Amazing time with so many nice sessions and people. Each complimentary and building up experience. Thank you very much. Incredible, Fantastic, Transformative, Deep, Enriching, Energetic, Joyful, Emotional, and Loving. The organisation was prompt in a friendly manner. I would have liked more free time in town and reflective time in between the sessions. I received some aha moments, and messages became clearer as the days went on. I also have some unclear visions and phrases that need to be processed, and I have all the excitement and patience for this to happen. Neelam was amazing with her wisdom, calming and soothing voice and her meditation that connects you to a very deep level within yourself. It was an added bonus and delight to have nutritional information in an inviting and clear format by Alex. Simply wonderful. I was blown away with the energy I felt here it brought up unexpected emotions, feelings and visions. The circle was beautiful, and the energy when we connected was mind blowing. The music was fabulous almost trance like bringing about an inner calmness. The goddess temple and Sound Bath was so illuminating it's difficult to put into words... but I didn't want to leave that place! The souls I have connected with here this weekend are so special, I feel really blessed and privileged to have been invited here. Amazing, Amazing! 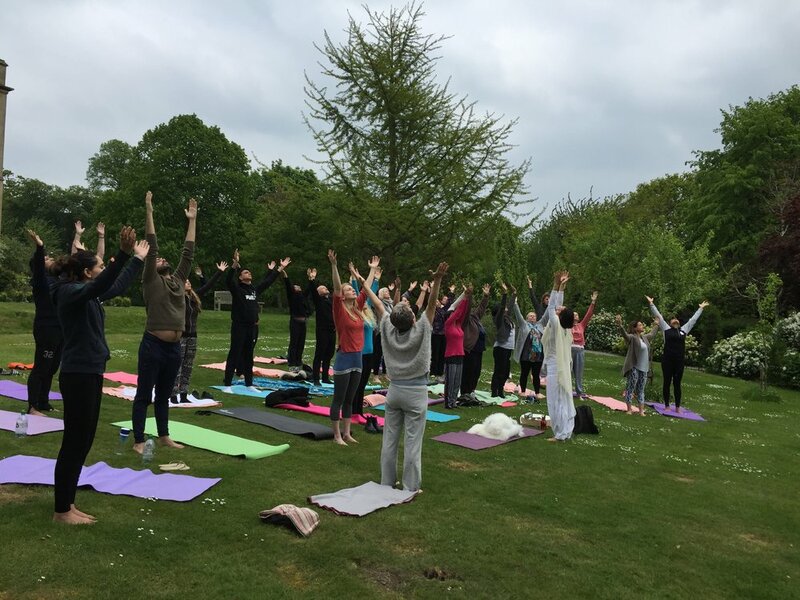 A wonderful group of beautiful souls - diverse and also with Neelam and Alex creating a safe, nurturing and welcoming and quality of space of possibility which allowed miracles to unfold - I experienced healing of mind, body and soul. The energy of the group the processes were wonderful. The elements of sound and water were instrumental in our development process - I found myself in bliss at times and very enriched at others. This was a profound and healtfelt experience. The unconditional love was tangible - overflowing at times. A very different type of experience. Good organisation, good choice of venue, beautiful views. Excellent team - very welcoming. Perfect music choice. My experience was wonderful, I always believe 'expect the unexpected' and I did. I got lots of relief answers and confirmation about life. I had alot of new experiences this weekend, I had visions which I'm yet to unravel. Connections were good and I always believe in fate and that is what brought me here. Everything happens for a reason. After the retreat it will be my time to reflect and look to make changes. Meditation and yoga will be a start. I'm looking forward to seeing what is in store for me. Everything was well organised and on time. Lovely venue and everything nearby. Would love to come back or attend another. Continue the printing of schedules each day... was helpful. Amazingly organised with great care. We were managed with understanding and to do that with 30 plus people is extraordinary. So polite and so kind it brought out the best in us. It was a combination of divine understanding and nurturing, a balance between the most intense spiritual experience, and practical advice, and all executed with love and care. Neelam is an angel sent to me and i feel grateful to have met her and for her guidance. The organisation was excellent. I can't find fault at all. This experience has been life-changing for me. It has given me the strength to follow my dreams. It has allowed me to realise that happiness is something we all deserve. I feel empowered to make the necessary move, and to go forward following my heart. Amazing location - WOW! Great food, lovely people! Thank you for the overwhelming experience. Energies that i have not experienced before. Life-changing to the beautiful people and myself. Awesome! Amazing, Amazing Amazing. I've had the most special and wonderful weekend. I feel relaxed, had fantastic sleep and have loved meeting so many special and unique people. The weekend has exceeded my expectations. I feel part of something profound and timeless. I feel at peace and hopeful about the future. I have not been able to piece all my visions together and know there is more work to be done, but this is a fantastic start. Seeing Sumesh transform and grow has also been a wonderful experience. Fantastic location. The experiences, food and timings were organised so well. Everything flowed and was planned perfectly. Just a beautiful 3 days filled with numerous magical experiences and realisations. I feel like I have a lot more light shining onto my path and my filter is a lot clearer too. I would highly recommend this retreat to anyone who wants to clear stagnant energies and gain a sense of real direction in their life. The event was highly professional, a real sense of caring and attention to detail in every way. Could not have been organised better. 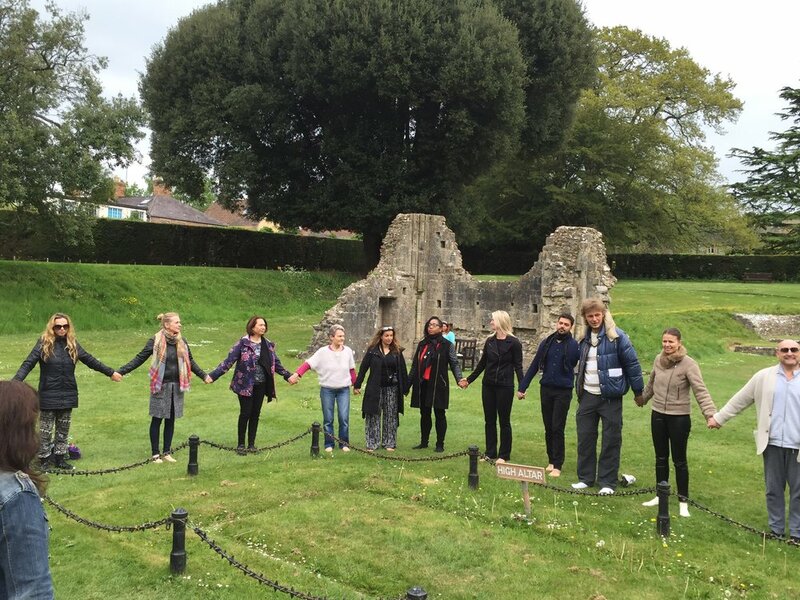 Retreat was very well organised, really appreciated the structure and how clearly it was communicated to us all - felt safe and held, which contributed to being able to surrender and drop into a deeper emotional experience and release. Thank you! Just what I needed. Totally amazing, beautiful people in a beautiful place. I feel nurtured. The transmissions, meditations, sound bath etc etc just amazing. Thank you so much for your wisdom, kind words and guidance. A lot of crying, which turned to a feeling of happiness. I had amazing conversations with people which answered questions for me. Neelam's energy has shifted a lot in me this weekend. I recommend Neelam to anyone who feels stuck and needs awakening. I look forward to watching life unfold and blossom. I have been nurtured and well loved this weekend. Something we all deserve, need and owe to ourselves. Event was extremely well organised. Covered a lot of energy work which was a lot more than i imagined. It felt like a glorious week. I had been lucky enough to have been on a spiritual retreat in Glastonbury before, and it was great. This one however was in a different league!! Wonderful people, incredibly well organised and inspirational leadership. Simple ... you can't improve on perfection! Nothing more to say. One of my greatest teachers has been Dr Michael Beckwith, he has a word that encapsulates this experience, "Blissitude" Could not have put it better myself, so i'm not going to try. With love to you all. Where do i start... i came with so many mixed emotions and some resistance but when i arrived completely surrendered and for the first time in my life experienced just being present and a quiet mind which was incredible. From allowing that opened up for me to fully connect and to listen to what the messages were. It made me realise this weekend to completely believe in myself. Thank you. Food was incredible, accommodation was lovely, the way the workshops and transmissions were scheduled were fantastic. The private goddess ceremony was life changing. ***** 5 Stars! Amazing - just a perfect balance of managing a complex and vibrant group to many wonderful events! Very subtle, never with pressure but with love. Awesome! Had a marvellous retreat very thought provoking. Improved my meditation skills hugely. Made fabulous friends and heard inspiring and rejuvenating stories. Powerful channelling, fabulous events opening up new directions for my exploration. Felt nurtured, safe, empowered. Hugely enjoyable and emotional journey. Very emotional time, I did not expect to be going through the memories and unfinished business. I feel pretty good now that i went through it again. The ceremony at the temple had a strong impact on me. Lots of releasing and receiving went on. Brilliant! The Glasto retreat has been transformational! Very well organised, with the right blend of 'work' with relaxation. I've gained so much from new friendships, and a deeper connection with myself. Thank you! When is the next one?! !